I’ve been meaning to do another noodles FACE-OFF and now that ramen is so hot in LA, I decided to check out relatively new but rapidly expanding newcomers Jinya and Yamadaya. 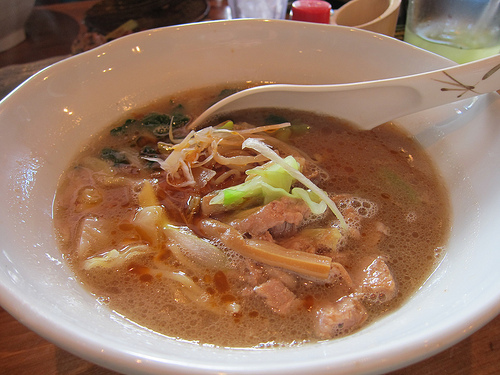 Being a stalwart Daikokuya fan, it’s hard for me to “like” other noodle houses though I do (boy do I love noodles). While I know I should have gone to the original Jinya in the Valley, the one at West 3rd seemed closer. After surviving traffic, I slid into my seat and prepared to eat! It’s a good thing the restaurant was cool while the day was warm because I wanted soupy, slurpy noodles. My friend had the special ramen that they only make a limited number of a bowls daily and I had the spicy ramen. 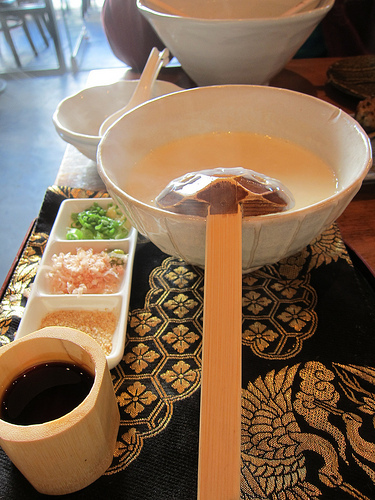 We also ordered a few robata items and the housemade tofu since we were at the robata location. I wouldn’t have normally ordered the chicken meatballs because I feared they’d be dry. I was pleasantly surprised to find them bouncy and had great texture. The pork belly all right, I like either crispier skin (and beautiful melty fat) or super tender meat. This was closer to tough and dry. I got there later than my friend so I captured her bowl midway. 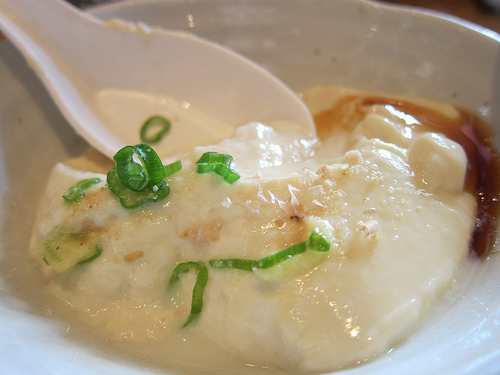 With the housmade tofu, it’s basically soymilk poured into a bowl with some “Japanese magic” (aka chemicals) that creates the soft, pudding-like texture. I found it to be well-flavored and hardly needed the additional garnish of scallions and bonito flakes and other condiments. 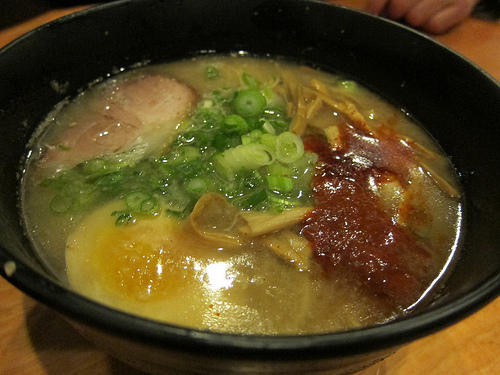 The spicy ramen is a tonkotsu broth (fatty pork broth) and the pork was delicious. Here were the big chunks of tender pork I was looking for. It wasn’t however, very spicy. I did find it sad it doesn’t come with any hardboiled eggs. You can add that and other toppings for an additional fee. What is this, Shin-Sen-Gumi? A few days later, I found myself at Yamadaya. I had heard this was the latest hotspot and there was a huge line of people waiting for a table. We eventually got our table and ordered a couple of large bottles of Sapporo to start. I decided on the tokotsu kotteri (which is even fattier fatty pork broth) with paigu pork. 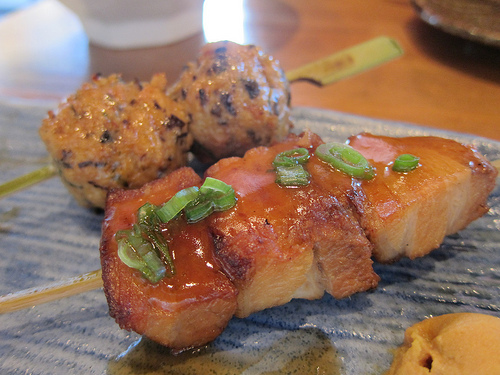 The pork was described as “huge fried pork loin”– oooh, sign me up. Unfortunately, they were super slammed and busy. 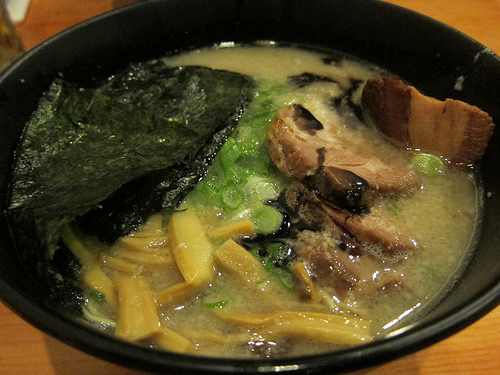 I ended up with their specialty Yamadaya ramen with kukuni (braised) pork. 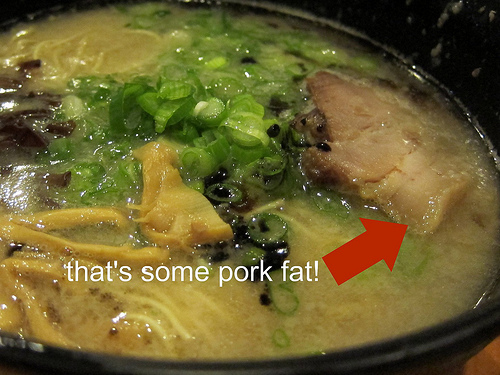 The ramen was admittedly very awesome but I wasn’t into the pork as much. 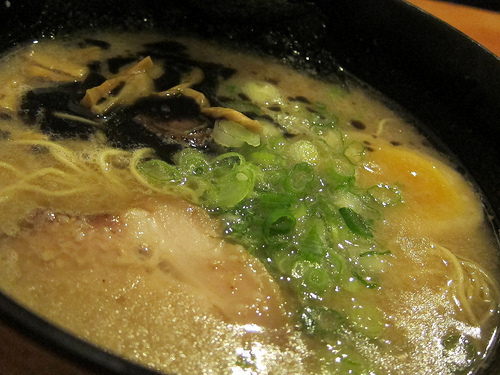 Friends had the regular tonkotsu, shoyu (soy sauce) tonkotsu and spicy tokotsu ramen. The Yamadaya ramen apparently features lots of bamboo shoots which I am a fan of. 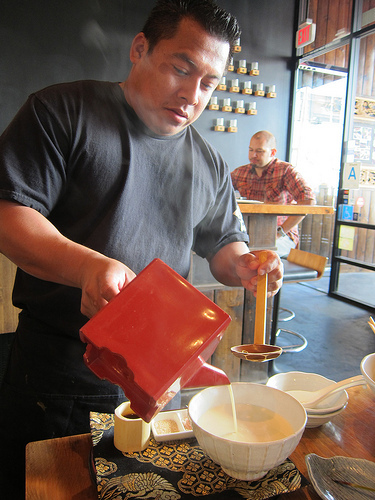 The broth has a thick cloud of fatty bits floating in it. It didn’t prevent me from slurping up the soup, cholesterol be damned, but probably not the wisest decision if you’re trying to be healthy. As mentioned, I didn’t like the pork as much but the bowl came with the most delicious egg. I’d go back just so I can eat this egg and I don’t even like eggs as much. Overall, Jinya won this round of the FACE-OFF. I can’t wait to take on other new ramen joints popping up all over town. 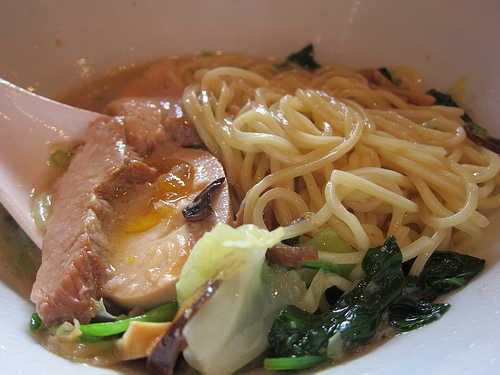 Wow, that ramen looks amazing! just like ramen here in Sapporo Japan. So glad you think so! Happy that LA has good ramen. But I still want to go to Japan one day for a ramen tour.